As I have moved from Canon to Fuji camera gear, I was feeling nostalgic and looked through my Lightroom catalogue for the first photo taken on my Canon DSLR. It was this photo of my Dad driving his first Porsche Boxster – he’s on his third now! The photo was taken eleven years ago in Bourton on the Water in the Cotswolds, I was sat on another bridge over the stream, with my legs dangling over the side waiting for Dad to drive past. I reprocessed the photo in Lightroom CC, to benefit from the newer tools and much more experience on my side. These days I would have gone for a slower shutter speed and panned with the car, blurring the background. However, I am still pleased with it as a first try at automotive photography. 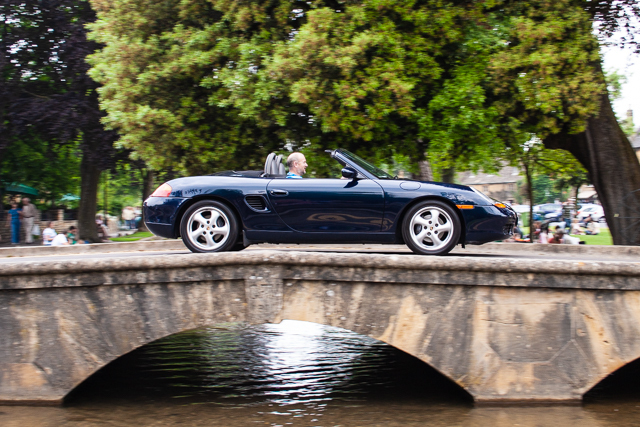 This entry was posted in Cars and tagged Bourton on the Water, Boxster, Cotswolds, Photo, Porsche, Throwback Thursday by Lewis. Bookmark the permalink.